With its statues and figurines, the handcrafted traditional Nativity Scene Ulrich cm 110 (44 inch), hand carved in wood, is a complete collection of original pieces for public and sacred places such as churches, parishes, hospitals, monasteries, schools and religious establishments. 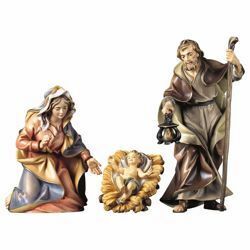 The big Nativity Sets’ rustic characters, the artistic backgrounds with stables and barns, the ornaments and accessories are handmade statuettes of great beauty. The large scale figures are carved in maple wood, painted entirely by hand with oil paint in such a way that the wood grain is preserved and lastly gilded with gold leaves by the master craftsmen from Ortisei Val Gardena. 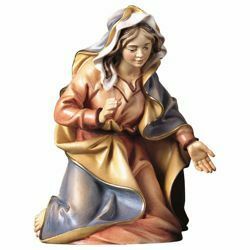 Complete collectible Nativity Scene traditional wooden figurines for Christmas decorations, with an excellent quality/price ratio. 100% Made in Italy. Mary / Madonna - Statue in baroque style in lime wood. 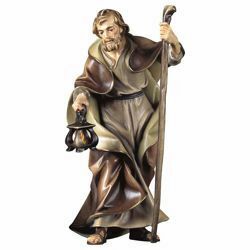 Saint Joseph - Statue in baroque style in lime wood. 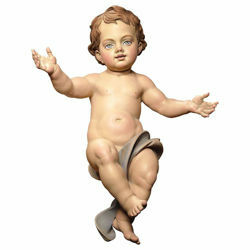 Baby Jesus - Statue in baroque style in lime wood. 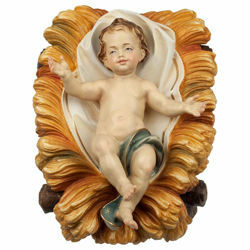 Baby Jesus in Cradle 2 Pieces - Statues in baroque style in lime wood. Cradle - Statue in baroque style in lime wood.